The Trappings of an Adventurer | Nuts and bolts. Mostly nuts. Well, good progress on Burhhelm – now, to help my gaming buddies catch up. Burhhelm managed to pound his way to Kindred reputation with the Algraig, forged a decent (though not spectacular) Reforged 2nd Age Sword for himself (and made another for a guardian friend), got the last of the Annuminas armor set, and bought a nifty new hauberk from the online store. He’s in pretty good shape, now. I have to note that the new horses offered in Enedwaith have more health than any of the previous ones, and I have mixed feelings about it. 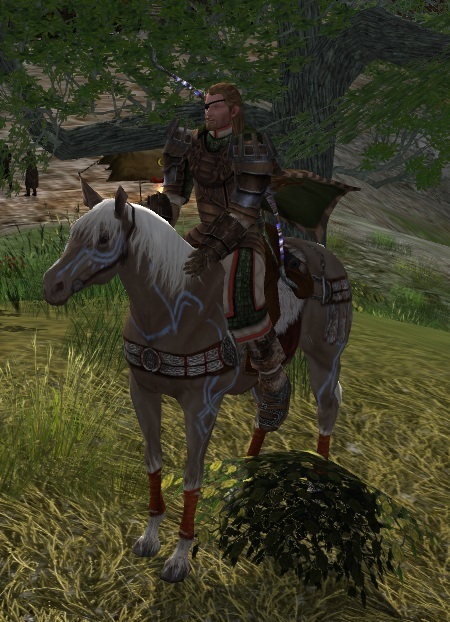 I feel that the grey horse you receive from completing all of Book I should be at least on par with these new mounts; after all, you take a great deal of time to complete the first book of the epic quest – the reward should fit the effort. Having explored just about all of Enedwaith, I have to say that the zone feels incomplete. There does not seem to be enough plot closure, such as when you finish all of the available quests in other zones. Right now, I am assuming that this is because Turbine will be adding content to the zone. If they don’t, it won’t fit cleanly with their storytelling quests from other zones. Let me close with a tip for this zone: when day comes, the Cuthraul vanish from the open plains of the Windfells, but not from the valley beyond the White Hand banner (Gwyllion’s Gate). I don’t know if they respawn during the daytime, but they will not despawn. This means that even though the sun comes up, you can complete that annoying repeatable quest that seems to be nighttime-only! This entry was posted on October 8, 2010 at 03:22 and is filed under Enedwaith, LotRO with tags LotRO. You can follow any responses to this entry through the RSS 2.0 feed. You can leave a response, or trackback from your own site.